Which are the best takeaway franchises at the moment? Global brands distract the attention of potential franchisees. However, we think we’ve found a new brand set for great things and the UK is ready for it. So, we feel that Bombay Bites is set to become one of the UK best takeaway franchises. It’s a multi award winning business, seen by millions in the ad breaks of the X Factor and Just Eat. We designed it and therefore it’s now exclusively available as a franchise through us! Why is Bombay Bites amongst the best takeaway franchises? 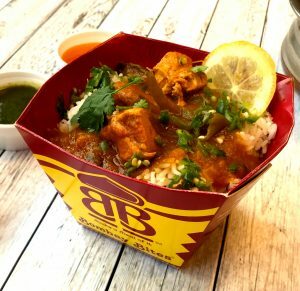 Bombay Bites offers something different to the traditional Indian takeaway. The company has taken the great British love affair for Indian food and created a simple, quick and affordable way to enjoy it. A self-contained meal conveniently eaten straight from the box. It’s a small footprint eat in restaurant that also delivers food all around the local area. The first Bombay Bites restaurant opened it’s doors in 2007 in Leicester city centre. Founder Ahmed Wahid has since established 3 locations in and around the city. Along the way Ahmed and his team have established quite a reputation earned by serving the highest quality convenient food with friendly and prompt service. Bombay Bites has also captured the attention of numerous judges at prestigious award ceremonies. They’ve won The British take Away Awards along the way. Just Eat chose Bombay Bites to feature in their X Factor advertisements!